There’s no doubting that Pinot is one of the most revered and collected wine styles in the world, with the top examples from its homeland in Burgundy selling for outrageous sums of money. It is generally quite delicate, and it takes a certain development of one's palate to truly appreciate its delightful nuances, perfumed aromas, textural elements and supple tannin profile. Pinot Noir has been grown in France’s Burgundy region for centuries. Burgundy is home to some of the world’s most expensive agricultural land, and some of the world’s most costly wines made from Pinot Noir are grown here. It’s possible that a clone of Pinot Noir made its way to Australia with the First Fleet in 1788, and it was definitely part of the collection of vines that James Busby established in the Hunter Valley in the early 1800s. Pinot Noir should be ethereal and hint at its origins or the soil it came from. Tannins are typically fine and soft, expanding at the back of the palate –referred to as a peacock’s tail finish. The best examples age well and often take some years to realise their true character. When tasting Pinot Noir, it’s worth bearing in mind that it’s not a big red wine, but that it is all about delicacy and length, harmony and finesse. Pinot Noir is also one of the classic Champagne grapes, and is prized around the world for the production of Sparkling wine. Winemakers love a challenge, and there is no doubt that Pinot is a challenging grape to grow, and even more challenging to make. The Burgundians have certainly nailed it, but they have been practicing for thousands of years, and this is part of the key. The cool climate of Burgundy has proven to be a major factor, as is the geology of the soils there, but they have also shown the variety to be very site-specific – vines grown in adjacent vineyards, and even different spots within the same vineyard, can produce very different results. Vine age too, is critical. True of most varieties, but especially Pinot Noir, the best fruit tends to come from mature vineyards, considered to be around 15 years old or more. Yields too, need to be kept low to get the best out of this grape, as it needs all the flavour concentration it can get to show its best. Pinot Noir was planted unsuccessfully in the late 1800s in Coonawarra, but was better suited to conditions in southern Victoria before phylloxera and other farming practises virtually wiped out the variety. The Yarra Valley’s re-emergence as a wine region coincided with the rebirth of Pinot Noir, and today it is the most widely planted red varietal in that region. The cool climates of Tasmania and the Adelaide Hills also offer great sites for Pinot Noir, while Western Australia’s Pemberton and Great Southern regions are showing potential to create fine Pinot Noir. Pinot Noir has steadily grown in popularity in Australia as consumers search for an alternative to fuller reds made from Shiraz and Cabernet Sauvignon. The best examples of Pinot Noir are grown in cooler conditions. Pinot Noir is temperamental and sensitive to a whole range of influences in both vineyard and winery. Australian Pinot Noir is typically low in colour pigmentation, has a perfumed nose and shows red fruit such as cherry, raspberry and blood plum flavours balanced by smooth tannins. Great Pinot Noir should age well and develop complex truffle, game and earthy characters. Australian winemakers have taken the lessons learnt in France to heart - gradually developing ever-cooler areas to grow Pinot, working out the best soil types, and carefully exploring the ideal sites within each vineyard to grow this fickle variety. They're also working out the best clones and the most appropriate vine spacing, and then managing the vine canopy to allow just the right amount of dappled sunlight to reach the ripening bunches. Our vines are getting older, reaching that critical phase of maturity, and yields are managed carefully to coax the maximum from each berry. Once in the winery, the grapes need careful handling due to their thin skins and low phenolic content, so physical pump-overs are kept to a minimum. These days more and more winemakers are including a percentage of stems in the ferment to enhance the aromatic and textural qualities of the finished wine, and oak usage is more skilfully matched to the style being produced. Tasmania has an ideal climate for Pinot Noir, for both Sparkling and table wine production. Some of the most exciting Australian Pinot Noir is produced in Tasmania, particularly on the east coast. Given its striking affinity with Pinot Noir, this cool, elevated region is among the finest in Victoria for the variety. Pinots from Macedon Ranges show restraint, power, finesse and complexity, all the hallmarks of great Pinot Noir. It’s also a serious Sparkling wine producing region. Home to some of the first great Australian Pinot Noir examples, the Geelong region produces concentrated wines with dark cherry and green olive fruit, and good depth. Some fine Australian Pinot Noirs are produced on the Mornington Peninsula. These wines are light and elegant yet show fabulous complexity and are often very approachable in their youth. The Yarra Valley has made exceptional Pinot Noir for some time. The wines are light in character, elegant and very approachable in their youth. The cool Western Australian region of Pemberton is making a name for quality medium-bodied, complex Pinot Noirs with attractive new world flavours of plum, cassis and mocha. We have seen a marked increase in the number and quality of Pinots coming from the West in recent years, particularly from the vast Great Southern area encompassing the five distinct sub-regions of Albany, Denmark, Frankland River, Mount Barker and Porongorup. Pinot Noir styles are varied with complex savoury styles from Denmark; elegant perfumed styles from Porongurup; rich fruit-driven styles from Mount Barker; big robust styles from Albany; lighter primary fruit styles from Frankland River. 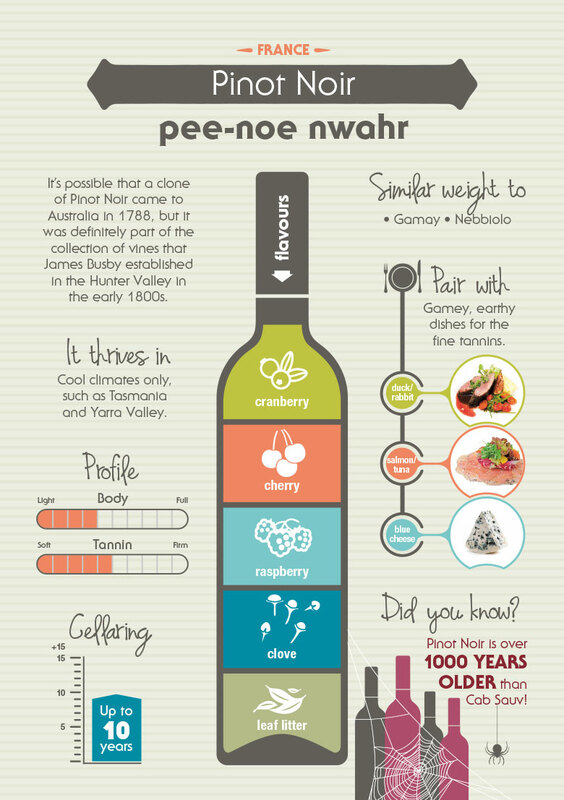 Also look towards the cool climate NSW regions of Tumbarumba and Orange for premium Pinot Noir. And surprisingly, there are small quantities grown in the Hunter Valley where the tradition of blending Shiraz and Pinot, perfected by the legendary winemaker, Maurice O’Shea, is making a resurgence. Charcuterie, ham, pâtés, terrines, goat cheese, and fresh green vegetables like asparagus. Crispy duck, grilled quail, char siu pork, seared salmon and tuna, and dishes with beetroot, figs or cherries. Mushroom dishes, grilled lobster, roast chicken, rack of lamb, and roast pork with fennel.